Basically, the light blue line is the unemployement rate the Obama administration predicted would happen if we didn’t pass the stimulus bill back in . The dark blue line is the unemployment rate the Obama administration predicted would happen if we did pass the stimulus bill. (Here’s the raw document.) 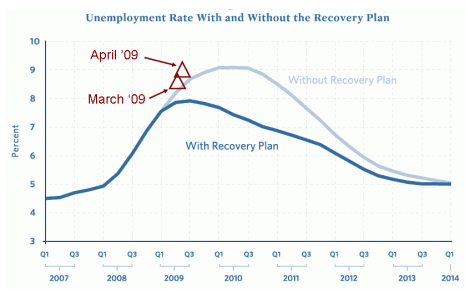 And the red triangles are the actual unemployment rate as it has panned out. Not only are they worse than the Obama adminstration expected, they’re worse than what they expected even if we didn’t pass the stimulus bill. I think it is fair to say that the stimulus bill has not been as stimulating as they told us it would be. Now, it could certainly be the case that the unemployment rate would be even higher than this if we hadn’t passed the stimulus bill, but that is about as non-falsifiable a statement as you can get. (UPDATE: The author of this graph explains why he thinks there has been little effect … we’ve spent almost none of the stimulus money yet. I’m trying to figure out where he’s getting his data because I don’t see any infrastructure projects on there. I’m certain that there is infrastructure spending going on right now because there is a stimulus project not 3 miles from my house causing daily traffic jams. I don’t really feel like dogpiling on the adminstration on this particular issue, so I want to hit a broader topic here… the administration’s use of numbers. This graph tells us some simple things that are scary and a complex thing that is scarier. The simple thing it tells us is that the Obama administration was completely unable to predict the economic conditions four months into the future. They thought we would be at about 8.0% unemployment if the stimulus bill passed and at 8.5% unemployment if we sat on our hands. As it turns out, we passed the stimulus bill and we’re at 8.9%. The easy lesson is that they didn’t get that one right. But, as Robert Strom Petersen said, “It’s tough making predictions, especially about the future.” And I probably couldn’t have done any better. But no one is hanging the weight of hundreds of billions of dollars around my neck, which makes it more OK that I can’t project the future economic conditions. It seems fair to demand a slightly higher level of predictive accuracy from an administration that is using their predictions to push trillion dollar policies. The complex thing that this graph tells us is that the Obama administration is comfortable using graphs that don’t really have a basis in reality in order to bolster support for their decisions. Graphs make us think that something is scientific and studied and therefore more reliable. But reliability is something that has to be earned. The team that put this graph together should be questioned on what they got wrong and what they would do next time to get it right. Keep up the good work… I’ll keep reading. Thank you for the penny demonstration – well done! Excellent!!!! Love the visuals. They really do a great job in providing perspective for the Average Joe to comprehend the magnitude of the conundrum our country faces with current administration’s economic policy. With all the data and graphs coming from the CBO/GAO, etc., one has a difficult time in disseminating the real effect of the numbers versus the “media” and the current Administration PR ploys. Thank you and please continue the excellent work. Kudos. I like seeing simple math concepts used to help the truth become more evident to the fast and furious pace of our culture. Keep it up. Glad you visited Innocent Bystanders. Come back anytime and good luck with your blog. I’m trying to figure out where he’s getting his data because I don’t see any infrastructure projects on there. You should just ask me. Basically I went through the reports of the agencies that Joe Biden’s report mentioned as having spent a significant amount of money. There were only 4: USDA, DoL, DoEd, and DHHS. My impression was that infrastructure projects have not yet received their federal funding. If you find out otherwise, please let me know. It’s possible that the states have kicked off some projects with their own money, anticipating the receipt of federal funds. I certainly hope that there hasn’t been much infrastructure spending to date, because that would make the unemployment situation all the scarier. I don’t think the stimulus package was well-conceived or well-timed, but I have always believed that if you drop a trillion dollars into the economy, some jobs have to be created. Thanks for coming by! I’m sorry, I should have contacted you… I assumed you would be overwhelmed since it seems like every blog in the universe was pointing to your site this last week. Also, thanks for your sharp eye on this issue. I confess that I’m spending all my free time just trying to keep track of where my data is.